Areas, distances and angles can be quickly measured on Google Maps using Android phones and tablets with “Planimeter - GPS area measure” App. Planimeter has a wide range of features that makes it a good choice for amateurs and professionals. The app is used in such areas as farming, road building and coating, construction and planning, solar cell panels installation, real estate, etc. "This is a must have tool if you have any reason to use geographical area or distance measurements." "Great! This application is awesome. I use it all the time on the go to calculate acreage and distance for new fields. I would recommend this to any farmer or custom harvester." Measurement results (distance and area) can be presented in metric or imperial units. 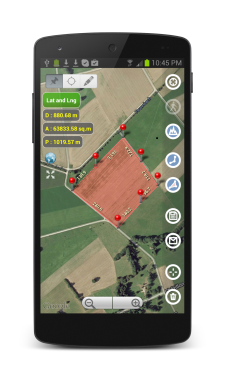 Meters, kilometers, feet, yards, miles, hectares and acres are available for distance and area calculations. Geo-coordinates are supported in DD and DMS formats. 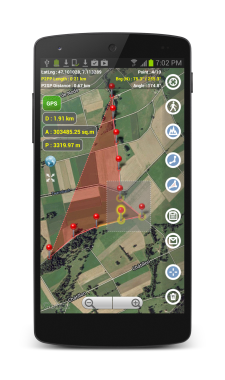 Polygons and paths can be measured and marked with pins in different ways: manually using touch screen, by entering geo-coordinates or using current location from GPS/Network , using address search. There is an option to make measurements using real-time tracking. The GPS tracking feature makes measurements as simple as walking or driving around an area of interest. Time intervals and accuracy for GPS tracking can be selected in settings or with shortcuts right from the main view. "...After taking the client to meet a lot of rural areas, the application show the road traveled and the total area of ​​the property. Really very useful and simple to use." Measurement results can be shared as a text message, screenshot or KML file through e-mail, messengers, Google Drive or other suitable applications installed on user's device. KML format allows users to export measured results to Google Earth or Google Maps or any applications with KML support. KML file contains detailed information about each point and measured values, so this information can be viewed in Google Earth or Maps by clicking a corresponding pin/marker8. Previously saved measurements (KML files) can be previewed, opened and edited through Planimeter app. Along with basic editing options such as Select, Move , Add or Delete a pin or multiple pins, there are some interesting smart path processing functions for quick automatic data editing. These are very useful features if a user has to deal with a large number of data points (e.g. in case of real-time GPS tracking or using drawing mode) or just need to simplify and remove redundant data before saving it into KML file. The app supports both portrait and landscape modes for large screens what brings even better work experience on tablets. The user is able to select appropriate mode in the settings. 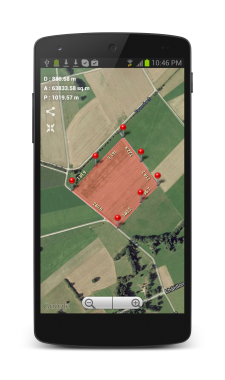 The availability of useful features combined with “easy to use” experience makes Planimeter app a good choice not only for personal use (e.g. hiking or jog planning) but also for professionals working in such areas as farming, road building, sealing and coating, construction and planning, solar panel installation, real estate business and many others. 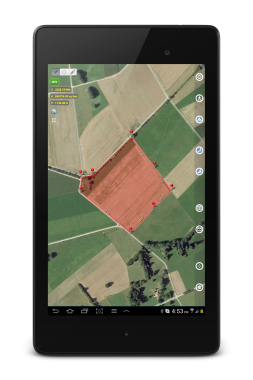 Many positive reviews and comments from the app users give a good overview of real life examples where Planimeter can be applied and used on daily basis and how it can simplify users work. 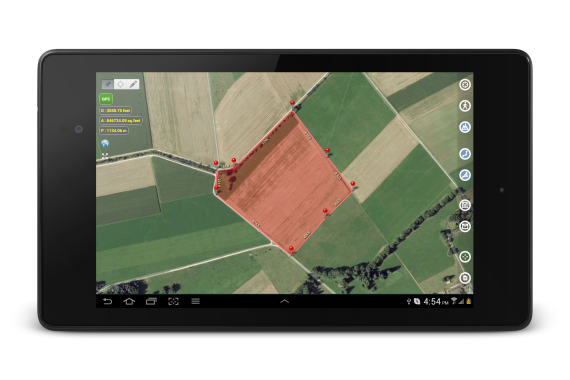 "Great Tool Found this to be the most useful and easy app to use for GPS assisted layouts. I've searched many apps and this one is the only one that simplifies the process and gives you the most information you need for project layouts." "Great app! Use to get an estimate of different pastures sizes. Worth a lot more to me." "This app covers all my needs regarding area measuring. It turns into the perfect tool for tracking field work." "I use this app to measure areas for paving. Has worked well so far. The trace feature is excellent for measuring chopped up and irregular areas." "Great app. Works great and it's easy to read the data into Google earth"
"This is still the best app available until Google Earth Pro is allowed to work on Android devices."